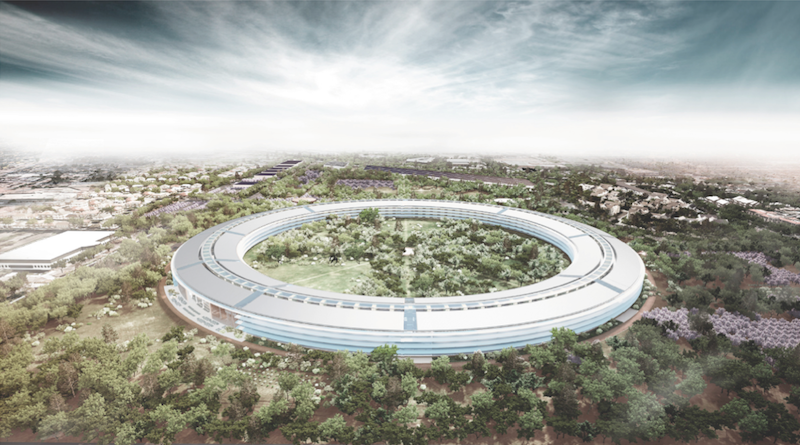 Jobs first outlined plans for the new the Campus 2 project in a presentation to the Cupertino city council in June 2011. The project was designed by noted architect Norman Foster. Earlier this week, Apple's current chief executive Tim Cook responded to question related to the status of the project at the company's annual shareholder meeting. Cook noted that the Campus 2 site currently has nearly 2.7 million square feet of office space spread around it, and that 80 percent of the land is covered by parking lots. The company's plan will bulldoze the existing buildings and construct a primary four story circular building with 2.8 million square feet, roughly three times the size of its current main campus on Infinite Loop. After the project is finished, paved parking will cover only 20 percent of the land, thanks to underground parking and a separate parking structure. In addition, Cook noted that the company has plans to expand its existing shuttle bus service to enable around 30 percent of the roughly 12,000 employees working at the new site to get to work without driving at all. This reduction in required parking will contribute toward Apple's plans to replace the existing vast areas of asphalt with trees and green open space, including orchards of apricots that pay homage to the original agricultural use of land. While Apple originally hoped to break ground last year, planning delays have held up construction. However, Cook announced this week that Apple hopes to begin construction this year, and said that the first Apple employees will likely be moving into the new Campus 2 by 2016. Cook also told shareholders that the new project would better accommodate large events. Apple's existing Infinite Loop complex holds a Town Hall theater and executive briefing room, but space is limited. For several years, Apple has pushed overflow crowds of shareholders and media observers into a separate room. This year, the company filed even larger crowds through its separate cafe area, which was partially converted into a third overflow area, complete with large screens for viewing the proceedings occurring in the main theater. Once the new campus is complete, Apple will be able to host all of its visitors in a main large new theater. Cook specifically said it would comfortably host shareholder meetings in the future, but it's also likely Apple will begin hosting other new events there, such the iPod and iPad unveilings it has historically held in San Francisco at the Yerba Buena Center for the Arts. Apple's massive new project is bordered by residential houses to the north (which currently sit opposite the existing, former HP office park). To the east, the project boundaries are ringed with other offices (including some used by Apple), as well as a Kaiser Permanente medical facility. To the west is the tree lined Wolfe Road (below) with a strip mall, a couple of nicer motels and an apartment complex (which Apple unsuccessfully tried to acquire) at the Wolfe 280 freeway interchange. 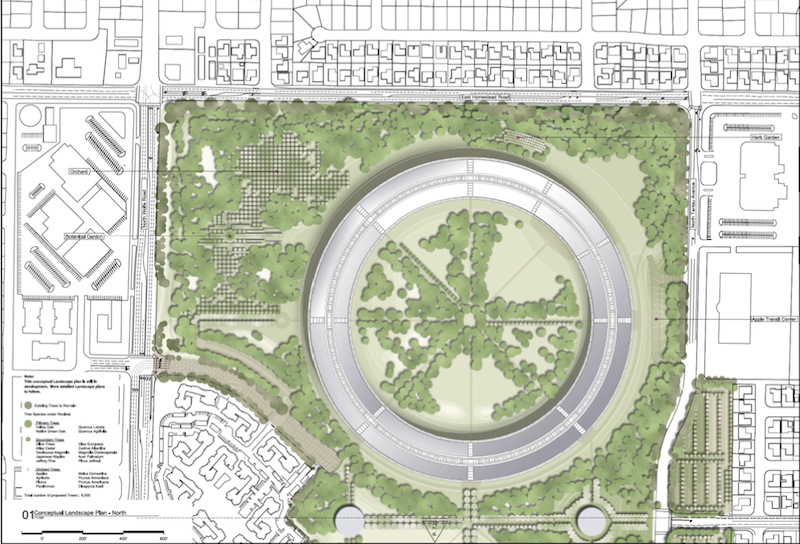 Apple's current plans for Campus 2 end at the freeway, rather than including the land the company owns and uses to the south, which was part of the original 2006 plan. South of this Vallco Parkway region, which Apple already has in active use, there is a swath of land being developed as moderate density condominium housing over retail. The southern portion of Apple's land was initially zoned for similar residential use, something that held back the company from getting started with its initial plans in 2006. This new housing, now under construction on Vallco Parkway (below), sits adjacent to the dowdy, virtually deserted 1970's Vallco Mall complex (far right end of image), the ground floor of which is currently closed and under renovation. The open upper level of the mall, which stretches across Wolfe Road via a skybridge, houses a theater, bowling alley and a few other shops anchored by a sad looking JC Penny, Macy's and Sears. Apple has been a fixture of Cupertino ever since founders Jobs and Steve Wozniak located the new company there in 1977, after about a year of working out of the garage of Jobs' parents, in nearby Los Altos. Jobs went to high school in Cupertino and expressed an affinity for the town in 2006, when he first addressed Cupertino's City Council regarding the company's initial land purchase. Jobs told council members he had looked at cheaper land in other places when considering where to locate Apple's second campus. "But after looking at a lot of things, we found something in Cupertino that was a possibility," Jobs said. "It was more expensive, a lot more expensive than we could get elsewhere, but it was something where we could stay in the area that we like the best."